Devotional: Extensive comments on spiritually rich texts. Focus on edification rather than critical or controversial issues (e.g. Matthew Henry). 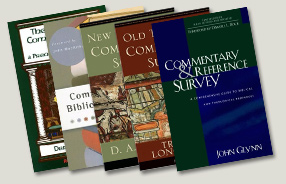 Ask pastors and professors for their recommendations on various books. Weigh the recommendations. Just because a Word series’ commentary on one book is good does not guarantee that they are all good. If you use commentaries too early, they will take over and suppress your own thought. Do your own exegesis rather than collate the work of others. This may seem like a contradiction to #4, but what I mean is that you should use commentaries earlier in the process if you get stuck, or perhaps can’t even get started. They can provide helpful or even essential historical, geographical, or cultural background. Use them to help you with specific issues but leave most commentary reading towards the end of your research. Remember to pray and seek the Holy Spirit’s help rather than just open the nearest book. Continue here for 15 other tips!